In this part we will explore the meaning of the 54th Shloka of Sri Vishnu Sahasranamam. Bhagavan is the presiding deity who drinks the Soma from the Yagnas and He is the drinker of Ambrosia or Nectar. 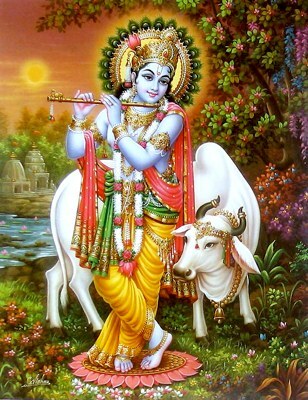 He is as sweet as Nectar to His devotees. He is the Conqueror of All with both His Valour and charm. His Cosmic form in its full glory makes Him the best of all. He subdues all and emerges victorious every time. He always keeps His promises and is most worthy of our offerings and gifts. Bhagavan is the Leader of Sattvataas or Bhagavatas. Soma refers to the Soma juice prepared from the extract of a plant called Soma. In the traditional Yajnas offering of the Soma juice to the presiding deity is an essential ritual. The performer of the Yajna also takes the Soma juice as Prasaadam or blessing. Somapah means someone who drinks the Soma juice. Sri Adi Sankara offers two interpretations. 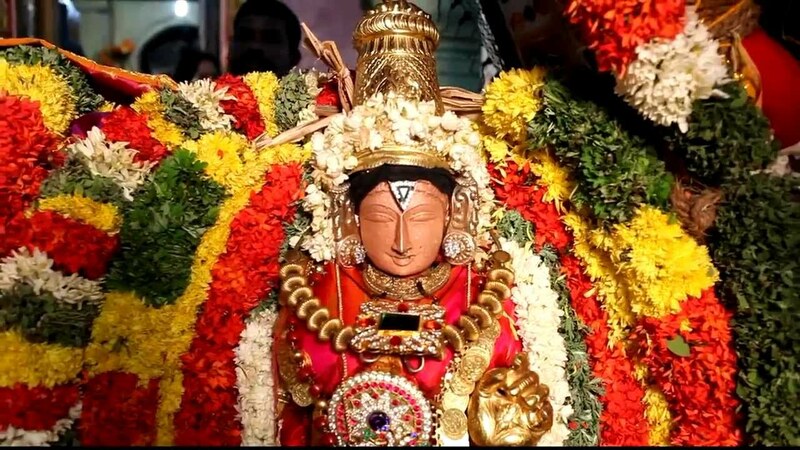 The first is ‘Somam Pibati Sarvayajneshu Yashtavyadevataaroopena iti – He drinks the Soma juice in every Yajna in the form of the presiding deity of the Yajna’. The Yajna may be in honour of any deity but Bhagavan gets the Soma offering as the ultimate controller of every Yajna. So He is the Somapah of each Yajna irrespective of who the immediate presiding deity is for that Yajna. The second meaning is ‘Dharmamaryaadaam Darshayan Yajamaanaroopena vaa – He consumes the Soma juice at the end of the Yajnas He performs as an example of Dharma to others’. Bhagavan has performed many Yajnas in His various incarnations for example the Ashwamedha Yajna in Rama Avatar. In these Yajnas He consumed the Soma juice as per the tradition and so He is called Somapah. Meaning: The Soma rasa is offered to deities like Garuda and Indra with the plea that riches be showered on the Yajna performer. Sri Parasara Bhattar’s interpretation is that this Nama signifies that Lord Rama performed several yajnas, and drank the juice from the soma plant after performing these sacrificial offerings. The Dharma Chakram writer points out that the juice of the soma plant is comprised of a constituent that gives long life – like nectar. This is offered first to the Devas to whom the Yajna is dedicated, and then the Yajamana (Doer or Karta) partakes of this Prasaadam. Amritah means nectar and Amritapah means the nectar drinker. Sri Adi Sankara gives two interpretations for this Nama. The first is ‘Svaatmaamrita Rasam Piban – He drinks the nectar generated within Himself as His AntarAtma’. Here the Amrita figuratively refers to the total and perfect bliss or joy that Bhagavan stands for and Bhagavan is always saturated with it. The second interpretation is ‘Asuraih Hriyamaanam Amritam Rakshitvaa Devaan paayayitvaa svayamapi apibat iti va – He recovered the nectar grabbed by the Asuras and after making it available for the Devas to drink, also drank it Himself, hence He is called Amritapah’. In this, Sri Adi Sankara refers to the Mohini Avatar where Bhagavan restored the Amrita snatched by the Asuras, retrieved it, gave it to the Devas to drink and He too drank it. Meaning: The oblations offered in sacrifices as prescribed in the Vedas along with the recitation of mantras are transformed by Agni, the God of fire, into ambrosia and offered to Vishnu. Thus Bhagavan is the drinker of the nectar, hence He is Amritapah. The alternate interpretation is that Bhagavan Himself is the Amrita, and He protects it for the benefit of His devotees so that they can enjoy Him in the Transcendental World after following the path of Dharma shown by Him. Meaning: Know that the Heaven, the Earth and the Sky, the mind with all the Pranas are interlinked by the Atma only. Give up all other talks. This is the bridge to Immortality (Moksha). Sri Radhakrishna Shastri suggests that since Bhagavan is in the form of Devas who drank the nectar, He is Amrutapah, the drinker of ambrosia. Swami ChinmayAnanda comments that as the Infinite Truth Bhagavan enjoys blissful immortality (Amritatvam) at all times, and in this sense He is One who has partaken Amritam. Sri Adi Sankara offers two meanings – The first is ‘Soma roopena Aushadheeh poshayan Somah – He nurtures all plants in the form of Soma or Moon, hence He is called Somah’. Somah refers to the moon and Bhagavan gives the power to moon to nurture and sustain all the plants which make life possible in the world. The second is ‘Umayaa sahitah Shivo vaa – Here Soma is taken as Sa + Uma, that is accompanied by Uma. This refers to the Ardhanareeshvara form of Shiva where Shiva and His consort Parvati are merged limb to limb in a single form with each taking half of the body form. 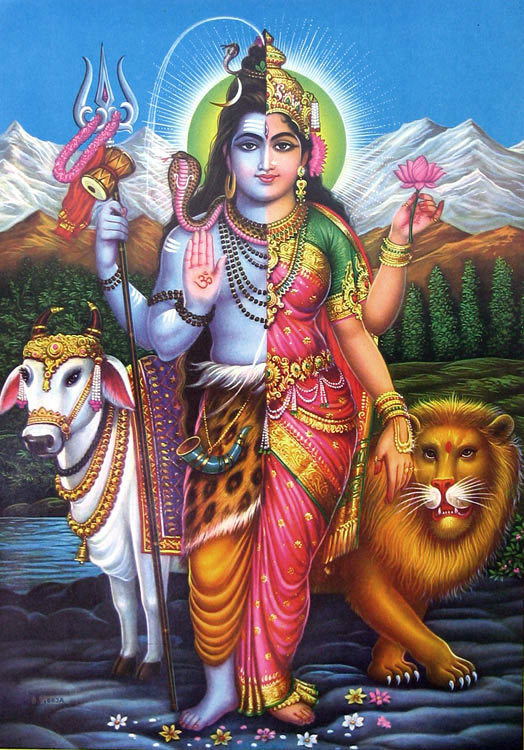 This combined image is called Somah and Bhagavan is called Somah because of His identity with Shiva. Bhagavan is called Soma (Nectar) here because He is sweet like nectar to the Bhaktas who enjoy Him. 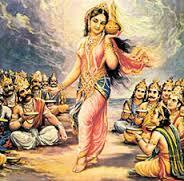 Sri Parasara Bhattar gives reference from the Ramayanam – Raajna Dasharathenaasi labdho’mritamiva amaraih (Aranya Kandam) – Dasharatha obtained Rama like the nectar from the Gods. Meaning: It (Soul) becomes Brahman whose body is boundless space i.e. the Sky (Akasha), its essential nature is Truth (SatyAtma), its playground the life-force (Prana); its consciousness a state of bliss (Ananda), it exists in serenity, in tranquility, in peace (Samriddham Shanti) and attains a state of Immortality (Amritam). Bhagavan’s ThiruNaamam is Aravamudan – The Insatiable Nectar. Sri V.V. 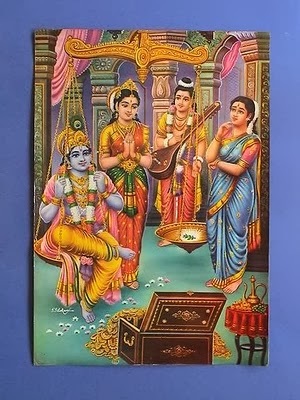 Ramanujan gives references from Sri Andal’s Thiruppavai – Sinatthinaal thenilankai Komaanai Manathukku iniyaanai Paadaavum Nee vaai Tiravaai – Come open your mouth and sing the praise of the Lord, who is sweet as nectar and dear to our heart, who in anger slew the demon-King of Lanka. Meaning: The Lord with his huge frame like an emerald, His eyes, feet and hands are like freshly opened lotus flowers. Every moment, every day, every month, every year, every age, age after age, He is my insatiable ambrosia that flows like a freshly made juice. Meaning: I enter into the planetary systems and through My potency I maintain all stationary and moving things. Becoming the essence of the Moon radiating the life-giving rays, I nourish all plant life. Sri Adi Sankara explains this as ‘Puroon bahoon jayati iti Purujit – He conquers multitudes of people hence He is called Purujit’. Here Puru means many or innumerable. Bhagavan is the conqueror of all as demonstrated in all His Avataars. 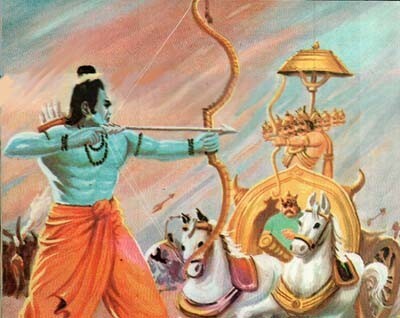 Meaning: Rama the valiant, conquers men by Virtue, the poor through charity, the elders by service and the enemies in battle by his bow, i.e., He has conquered all. Sri Ramanujan also observes that Lord Rama has the distinction of winning over three of the members from the same family by different means; Ravana was conquered by the Lord by His Valour, Vibheeshana by His Dharma and character, and Shurpanakha by His captivating looks. Thus, the Lord has conquered many by various means. Meaning: He who has under His control all the constellations, the lands, the oceans, the different worlds, all the souls, and everything there is, is Purujit. The Dharma Chakram writer observes that the same attributes that helped Rama win over everyone viz. dharma, truth, humility, compassion etc., are the attributes we need to overcome obstacles in life. When obstacles arise for those who practice these traits, they will take these as temporary incidents that are a test of their resolve and when they act with unflinching faith they will gain ultimate success. This was true in the case of Raja Harishchandra and also the Pandavas. This Nama of Bhagavan should teach us to follow the path of Dharma that will ensure the ultimate success in life. This Nama is a combination of two attributes, Puru and Sattama. Puru refers to his multi-faced, multi-headed, multi-eyed, multi-dimensioned cosmic form (Vishvaroopam) which He displayed to Arjuna at the time of the battle of Kurukshetra. Sat is good and Sattamah is the best or the highest. Sri Adi Sankara interprests this as ‘Vishvaroopatvaat Puruh, Utkrishtatvaat Sattamah; Purushchaasau Sattamashcheti Purusattamh – He is Puru because of His Cosmic Form and He is Sattamah because He is the best and the greatest. Since He is both Puru and Sattamah, He is called Purusattamah’. Meaning: O King! My love for You is very great and it is firmly planted. O Warrior! My devotion to You is even more steady. I cannot think of going anywhere else (leaving this world where You have enslaved me). Swami ChinmayAnanda gives the meaning “great” to the word Puru, and interprets the Nama as Bhagavan being the Greatest among the Greats. He opines that the Paatham Purushottamah is used in some versions for this Nama, and the meaning is given in terms of Purushah and Uttamah – Omnipresent and the Best. Sri Satyadevo Vasishtha interprets this Nama in terms of three constituents of the Nama – Puru, Sat and Tama. Taking ‘Sat’ to mean existence, He is far superior to anything that exists, since everything except Him is impermanent or anityam (temporary), and He is the only Nityam (Immortal/Permanent). The Dharma Chakram writer gives the meaning “He who shines through many great forms” and refers to the Vibhuti Yoga in Srimad Bhagavad GIta. He is the Sun and the Moon in those that shine, Sama Veda among Vedas, Indra among the Devas, Gayatri among Mantras, and Lion amongst animals etc. Sri Adi Sankara explains this as ‘Vinayam Dandam Karoti Dushtaanaam iti Vinayah – He punishes or subdues the evil doers, hence He is called Vinayah’. He causes the evil-doers to have humility (Vinayam) by punishing them. So the punishment comes in the form of humbling the opponents. Sri Parasara Bhattar interpretation is ‘Vineeyante damyante iti Vinayah – He who subdues’. 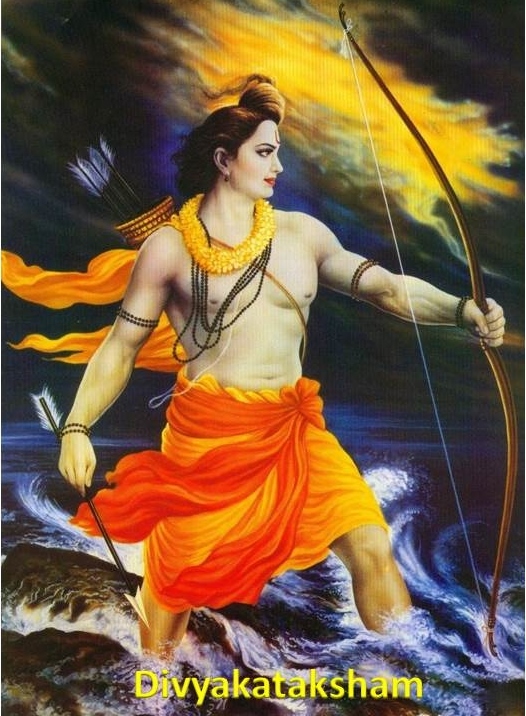 He gives the example of the subduing of Mareecha by Lord Rama through His Valour. He causes the evil-doers to become humble (Vinaya) by vanquishing them, hence He is Vinayah. Swami ChinmayAnanda observes that the direct meaning of the word Vinayah is “He who shows Supreme humility”. Here it means “He who humiliates those who are unrighteous”. He also gives an alternate interpretation – Vi-nayah, where nayah refers to He who leads (Neta), and Vi-nayah refers to the Lord who leads the seekers steadily through the path of truth and righteousness. Sri Adi Sankara interprets this as ‘Samastaani bhootaani jayati iti Jayah – He wins over all beings hence He is called Jayah’. The victory is not only in the physical sense. Bhagavan conquers and captivates our minds and hearts too, so He is Jayah (the conqueror) in every sense of the term. Sri Parasara Bhattar interprets this to mean the Nirukti description of ‘ASritaih jIthate yasmaat vidheyokriyate jayah – One who has been conquered by the devotees and who acts according to their wishes’. 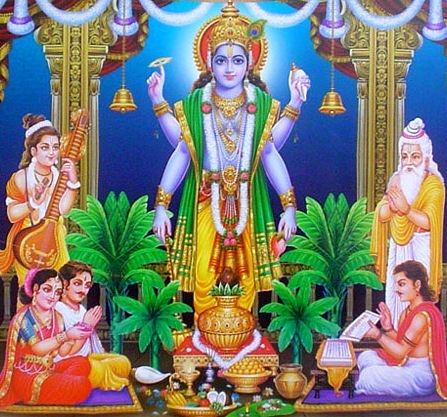 Sri Bhattar gives examples of this quality of Lord Rama from Srimad Ramayana – “AjinApyo’ham tapsvinaam – I am to be commanded by the sages” i.e., I am at their disposal” (Bala Kandam 3.37); tato Narayano Vishnuh niyuktaih sura-sattamaih – Lord Narayana was directed by the Great Devas (Bala Kandam 16.1). Sri Satyadevo Vasishtha observes that Jayah connotes Bhagavan being Omnipresent, controlling everything, having conquered everything and everyone, Invincible etc. The Dharma Chakram writer explains the context of being victorious for our day-to-day life. The lesson that we should learn from this Nama is that there are always two aspects to our character – acquiring and practicing qualities that are conducive to our realisation of Bhagavan, or indulging in activities that are contrary to this. Being subservient to wealth, committing even a-dharma in order to acquire and accumulate wealth, pursuing fame and fortune instead of devoting our life in the service of the Lord are examples of latter. Ravana, Duryodhana, Hiranyakashipu etc. were examples of characters who fell prey to their inferior instincts in their lives. The victory that we should aim for is over the baser instincts that will result in the success of our effort to cross the Ocean of Samsara. For real victory in this life, we should develop and practice characters such as kindness and compassion towards others, engage in service of the needy, discipline, devotion or Bhakti etc. Sri Adi Sankara says ‘Satya sandhaa sankalpah asya iti Satyasandhah – His resolution or plan of action always comes true, hence He is called Satyasandhah’. The word Sandha is equivalent to Sankalpa or a determination or resolve. Any resolve is always fulfilled by Him in terms of action. Sri Satyadevo Vasishtha gives the meaning Pratijna or promise to the word Sandha. Thus Satya Sandhah means He whose promises are always true. Meaning: I may forfeit my life, forgo Lakshmana, or even forsake you Seethe but not a promise; that too made especially to Brahmins, and having promised I can never go back. Sri V.V. Ramanujan gives reference to NammAzhwar in Thiruvai Mozhi (9.10.6) – Naalum tan meyyarkku meyyane – Always true to His true devotees. Sri Ramanujan comments that Bhagavan was not only true to His devotee Prahlada, but He became true (i.e., made His appearance) to even His adversary Hiranyakashipu in the process (Poyyanukkum meyyan!). Sri Ramanuja conveyed in Saranagati Gadyam – Ramo dvir-naabhibhaashate meaning Lord Rama never speaks a second time i.e. He will not say something first and go back on it as He always keeps his word. 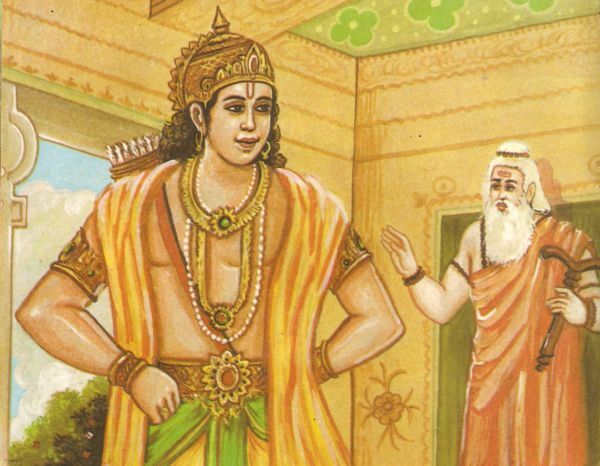 In Srimad Ramayana Lord Rama says to Sage Vishwamitra – “Anritam nokta purvam me na ca vakshye kadacana – I have never spoken a lie ever before, and even if I were to land into any predicament I will never lie anytime in the future”. Swami ChinmayAnanda quotes the following from Purana, “Heavens might fall down, the Earth might tumble down, the Himalayas might be crushed, the ocean might become dry, but My word uttered shall never be in vain”. One day an old Saint came to Lord Rama and asked him for a private audience. The Saint said that no one should enter the room in which they were having the conversation. Sri Rama directed Lakshman to guard the door of the room and said that if anyone entered the room during the conversation he will be put to death. The old saint was Kala Deva, or Time, and He appeared to remind Sri Rama that the objectives of Sri Rama’s appearance on earth were completed and it was time for him return to Vaikunta. While this conversation was going on the hotheaded Sage Durvasa appeared outside the room and demanded for an audience with Sri Rama immediately. 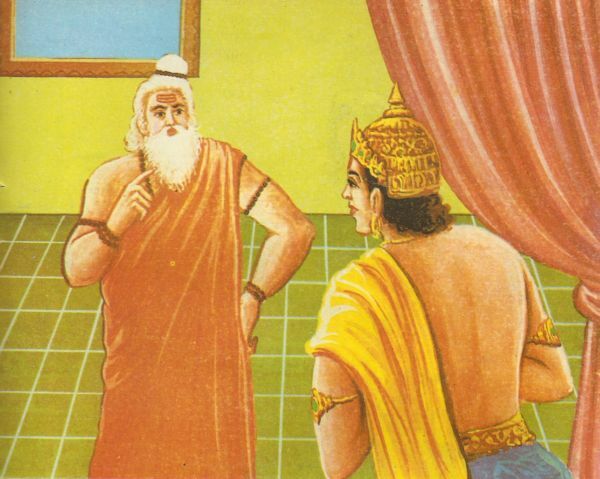 Lakshman tried to explain the situation but Sage Durvasa became angry and threatened to curse Lakshman if He was not allowed inside. Lakshman now was left with two choice death or curse. Soon Lakshman realised that this particular situation was the play of time for Him. Lord Rama immediately asked Lakshmana to fulfill the promise He had given to Kala Deva. 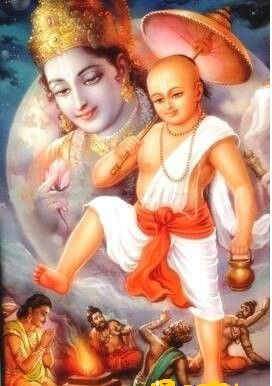 Lakshmana immediately agreed to disappear from earth to fulfill Lord Rama’s wish. He then walked into the Sarayu River and took the form of Ananta Sesha. Rama always kept his promise even though He had to lose his dear brother. The Nama is derived from the root Daashr* Daane – to give away, and arhah meaning deserving. Sri Adi Sankara gives two interpretations for this Nama. The first is ‘Daasho Daanam tam arhati iti Daasharhah – Daasha means a gift and Bhagavan is worthy of all gifts we can offer and hence He is called Daasharhah’. The second is ‘Daasharha kulodbhavaat – He was born in the race of the Yadavas and hence He is called Daasharhah’. The term Daashaarha refers to King Yadu and as Krishna was a descendant of the Yadavas, He is called Dasharhah just like the descendants of Raghu are called Raghavas. Sri Parasara Bhattar explains that Bhagavan is perfect entity for us to offer ourselves to Him, or alternately, He considers His Supreme Self ideal to be offered to His devotees. Swami ChinmayAnanda observes that Bhagavan is fully competent to receive all the offerings made with devotion in the ritualistic sacrifices. Meaning: In exchange for your great favour of mingling with me, I have you in my heart; now how can I ever retrieve it? O’ Lord who swallowed the seven worlds! You are the soul in my heart. Who am I? What is mine? You gave and took what is yours. The Dharma Chakram writer observes that Bhagavan is perfect for our offerings over anyone else, since He accepts all our offerings including our sins, and if we offer our Karma-phalan to Him, He relieves us of all the effects of our Karma and bestows Moksha on us. Sri Adi Sankara’s interpretation is ‘Saatvatam naama Tantram teshaam patih Yogakshemakarah iti Saatvataam Patih – He is the Leader of those who follow the tantram or practice called Saattvatam, the scriptures which are essentially Saattvic in nature’. He is their leader in the sense of being their Yogakshemakarah, the provider of wealth and the safekeeping of the wealth. Sri Parasara Bhattar gives a detailed derivation of the word Saattvata starting from the word Sat meaning either Supreme Brahman or the quality of Sattva. Sattvan is one who knows Brahman or one who is possessed of the quality of Sattva. Saattvata signifies the act of a Sattvan in knowing Brahman or in acquiring the quality of Sattva or the scriptures followed by a Sattvan. Saattvatas are thus Bhagavatas. Since Bhagavan is the Lord of the Saattvatas or Bhagavtas, He is Saattvatam-patih. The Yadava race is also called the Saattvata race. Since Lord Krishna is the Lord of the Yadavas, He is called Saattvatam-patih. Swami ChinmayAnanda observes that the path of the Saattvatas is single-pointed meditation upon the form of Lord Vishnu with absolute devotion. Bhagavan is the presiding deity who drinks the Soma from the Yagnas and hence He is Somapah. He is the drinker of Ambrosia or Nectar, so He is called Amritapah. He is as sweet as Nectar to His devotees, so He is Somah. He is the Conqueror of All with both his Valour and charm, hence He is Purujit. 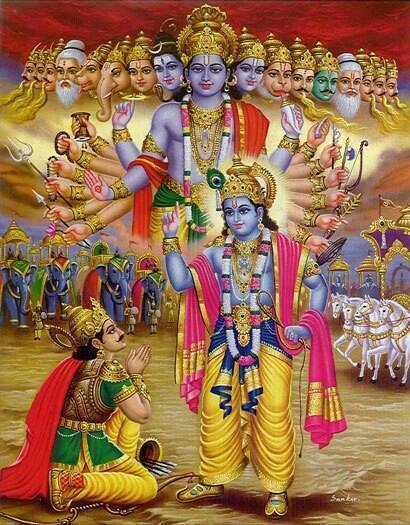 He is Purusattamah in His Cosmic form in its full glory as He is the best of all. He subdues all and hence He is Vinayah. He emerges victorious every time, so He is Jayah. He always keeps His promises and never goes back on his word, so Bhagavan is called Satyasandhah. Bhagavan is most worthy of our offerings and gifts, so He is Daasharhah. Bhagavan is the Leader of Sattvataas or Bhagavatas, hence He is SaatvataamPatih. Thank you, Sridhar. I have couple of questions: Is Soma a real plant? 2. What is the meaning of “Dharmamaryaadaam”? Hari Om! Sorry for the belated response. There have been lot of attempts to identify the Soma plant and there have been several speculative suggestions ranging from some herbs, epherdines to Cannabis, but none conclusively established. Dharmamaryaadaam means one who know how to respect Dharma. (Harih Om, Salutations to Mother Lakshmi) Those who carry Sri Vishnu in their Heart (like Garuda, the son of Vinata carries Him on his back) always drink Soma (the Divine Bliss within); Let all Drink that Soma by Destroying their inner Enemies of desires (thus gaining nearness to Sri Vishnu). That Soma originates from Sri Who is the embodiment of Soma (the Divine Bliss); O Mother, please Give that Soma to Me too, You Who are the possessor of that Soma.